Imagine a blind date without someone in the other chair. This week, we are on the political dating circuit, meeting some of Michigan’s statewide hopefuls who will not appear on next year’s August primary ballot. We’re talking about ticket-building and why some candidates for statewide office aren’t waiting until after next year’s primaries to go public with their aspirations. Primaries allow voters to choose only some of the candidates who will be on the November ballot. Relatively few, actually, when it comes to statewide races in Michigan. Just governor and U.S. Senate. Democrat and Republican voters will choose their candidates for those offices in the August primaries. And, based on their 2016 voter turnout, Libertarians qualify to choose their gubernatorial and Senate candidates next year in a statewide primary, too. But, under state law, the candidates for lieutenant governor, secretary of state and attorney general will all be chosen after the primaries at state political party conventions. The current holders of the office - Lt. Gov. Brian Calley, Attoreny General Bill Schuette, and Secretary of State Ruth Johnson are unable to run again because of term-limits. Dana Nessel, Michigan’s most famous gay rights lawyer, announced last week that she’s seeking the Democratic Party’s nomination for state attorney general. She will likely be joined soon by former west Michigan U.S. Attorney Patrick Miles, a Barack Obama appointee, and state Representative Tim Greimel, former state House Democratic leader. On the Republican side, we know state House Speaker Tom Leonard and state Senator Tonya Schuitmaker are both eyeing the race for attorney general. So, whether they’re announced or not, why would prospective candidates get out this far before the party conventions? Well, a big part: this is an audition. At these conventions, party leaders look at who voters elected for governor during the primary and then they start to strategically select the lieutenant governor, secretary of state and attorney general to maximize the chances of winning. They also decide on candidates in order to satisfy each party’s donor class (the ones who will be responsible for funding the campaigns). Getting out now also lets these nominees show party leaders that they can connect with voters and deal with necessary campaign tasks like organizing and fundraising. But, just like in any other election, getting out early is no guarantee of a win because so much will depend on who each party’s candidate for governor is. When Republicans are putting together their slate, they tend to be mindful of ideological tests - issues like abortion and education. Democratic leaders focus more on ticket balancing, basing choices on ethnicity, gender and geography. Candidates hoping to win over a convention want to head into the arena with an aura of inevitability, that this is a rising star who can lift an entire ticket. Like Jennifer Granholm in 1998. Democratic primary voters chose fiery trial attorney Geoffrey Fieger to be the candidate for governor. Dem party poohbahs identified Granholm as an up and comer with the capacity to win as Attorney General. Fieger lost, Granholm won, and four years later, she ran for governor and won. So, it’s a year out, but let the ticket-building begin. Can lawbreaking lawmakers keep their jobs? Can a politician who breaks the law be forced to quit his job and be ordered not to run again? That question could interrupt the Michigan Supreme Court’s summer recess. The Michigan Supreme Court this week said “not yet” to a group trying to stop fracking in Michigan. The group, The Committee to Ban Fracking in Michigan, is now on its third attempt to get a question on the ballot to ban the controversial process used to drill hard-to-reach pockets of natural gas. After this week, we’re starting to get a clearer picture of what the 2018 governor’s race will look like in Michigan. 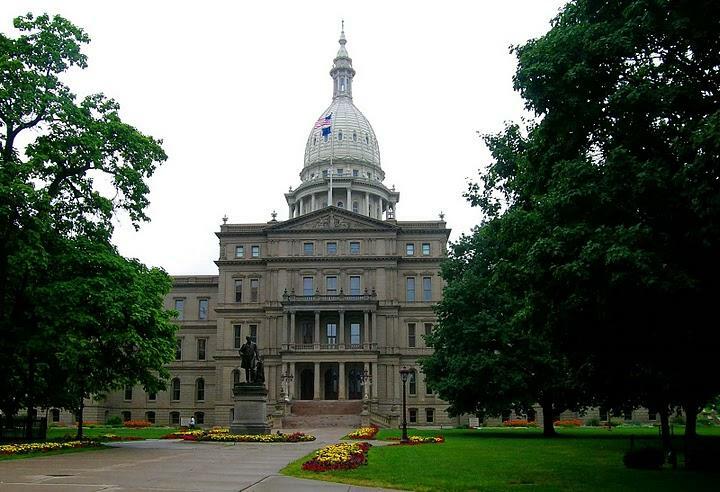 In just a little more than a year, Republicans and Democrats in Michigan will choose their candidates for governor in the August primary. Governor Rick Snyder is term-limited so, it’s a wide open field. Joan Larsen faces a tangled path to a plum spot on a federal appeals court. The only thing standing in her way is Michigan’s two U.S. Senators. "Good Jobs” bill: Snyder backed it. Republican leaders opposed it. Both parties passed it. Stateside's conversation with Zoe Clark and Rick Pluta, Michigan Radio's It's Just Politics team. Today is the only day this month that Michigan's lawmakers are in session, and the House used it to vote on a major new tax incentive for businesses. Months of lively debate ended when the tax incentive package passed with bipartisan support. It was a vote that defied House Republican leaders and Speaker Tom Leonard, and served up a big win for Governor Rick Snyder.